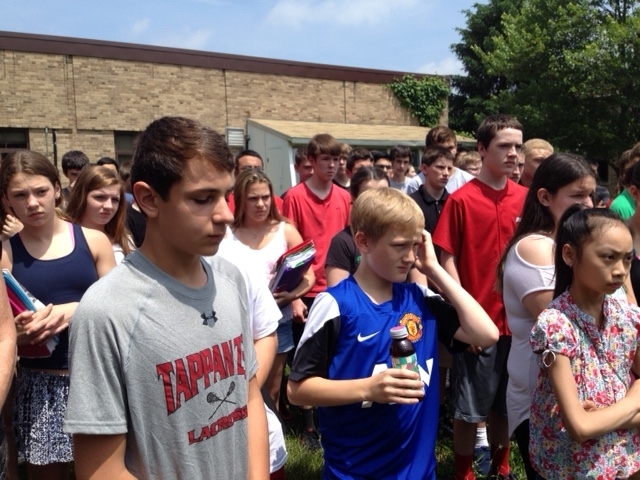 “I looked forward to seeing her in Spanish class eighth period every day,” began one girl. She’d always make me smile. 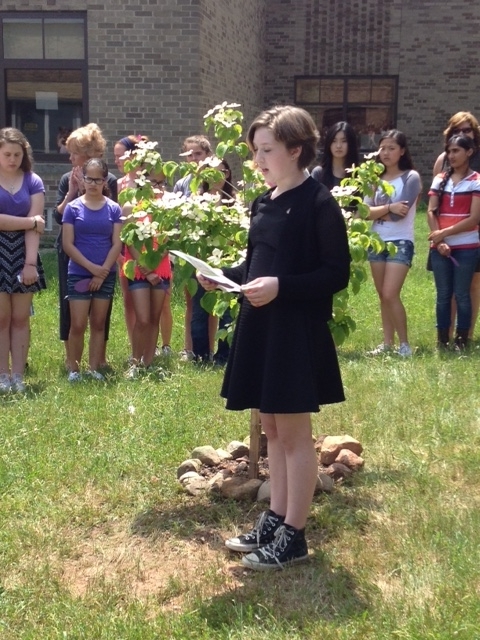 When we talked, she’d brighten my day,” one eighth grader read. Another girl said, “She could always make me laugh even when I was in a bad mood.” Reading solemnly from their heartfelt letters, the children moved me with their innocence. The descriptions went on and on: She loved talking about movies and books. She was selfless, strong and kind-hearted. She always had a smile on her face. She would stick by you and support you one hundred percent. 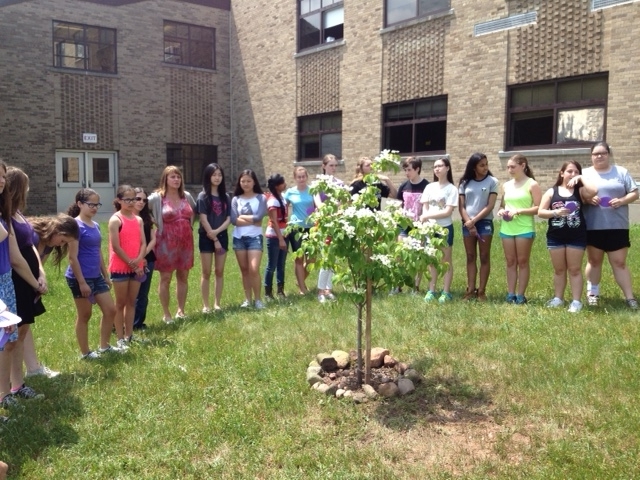 We stood in a circle around a flowering dogwood planted in Emily’s memory. 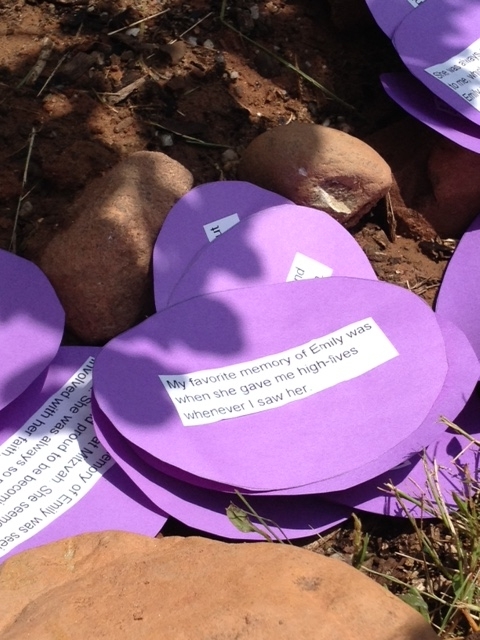 Her friends placed purple circles with their thoughts of Emily around the base of the tree, like Jewish people visiting a grave and placing stones to show that loved ones remembered. It was a beautiful ceremony, simple and sweet. I wondered how these children will ultimately weave this experience into their lives. The sudden death of a thirteen-year old peer is shocking, unusual, inexplicable. Is the experience truly theirs to hold? Doesn’t Emily’s death and its inscrutable meaning belong to her parents Cindy and Marc and her sisters Cara and Jordyn? This ritual moment was one of thousands of moments of grief that Emily’s immediate family has experienced over this year. Doesn’t the loss belong to them? I ached for these children, young and innocent. So many parents work very hard to protect their children from the harsh realities of the world. What need had the children of recalling the sorrow of loss? Jewishly, the answer to my questions is clear. Emily’s classmates need to learn that loss is a part of life. There is no turning away. Rabbi Scheff’s yizkor sermon this past Monday on Shavuot brought comfort and more answers. Community, he said, provides us with a narrative to remind us that we are part of something bigger than ourselves. Yes, we must experience others’ sorrow when we are part of a community but we also experience their joy. And in so doing, our lives are broader and deeper than they would otherwise be. Rabbi Scheff was speaking about the Orangetown Jewish Center community but his words teach about all communities. 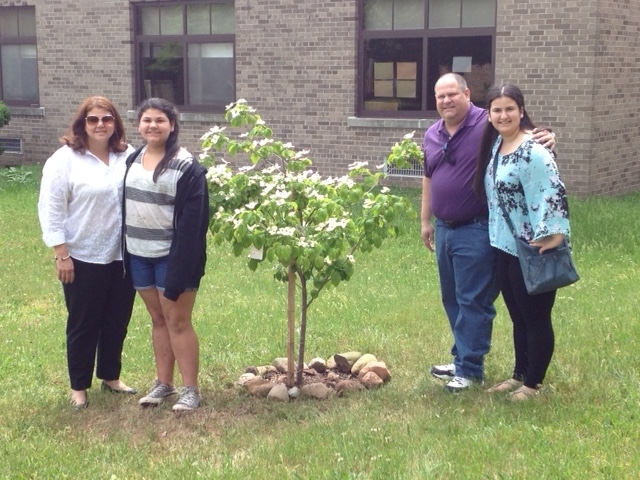 At South Orangetown Middle School today, a class of eighth graders circled around a baby dogwood tree and learned that being part of a community is the only way we can live fully and completely, doing our part to make this world a better place, one corner at a time. Your words, ever so gentle and tender, certainly make it easier to accept, especially for youngsters, the realities of life. As always, your words bring light to the unimaginable. I watched the posting of the memorial and smiled and cried. Emily will always hold a special place in my heart. 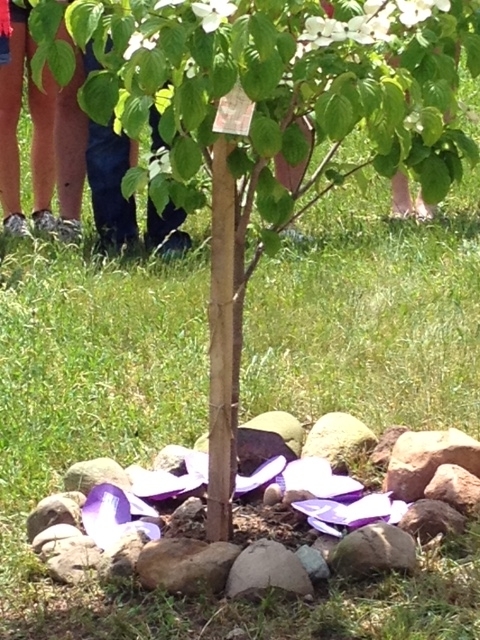 How wonderful that these amazing youngsters established a LIVING memorial to Emily.. She was special and no one will ever look at that tree without thinking of her. And…you and Rabbi Scheff are so right on with your stressing of community in dealing with loss (and joy). I have said so many times I could not make it without you both and without my OJC community. I remember, with joy, the pleasure of Lou’s 2nd Bar Mitvah (at 83) and the warmth and love that we feel emanating from everyone there. So, thank you , once again for always knowing what to say and when to say it.